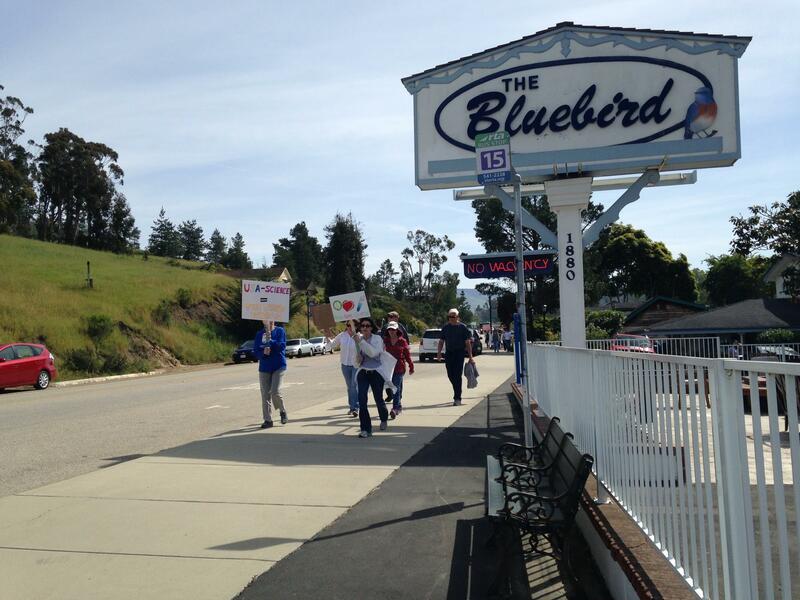 Cambria residents marching for science. 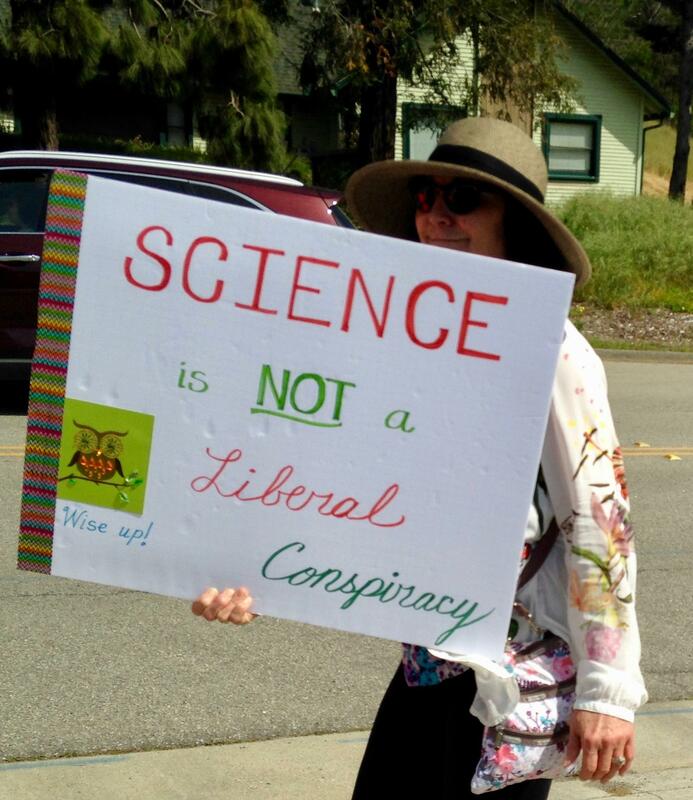 One of the signs seen at the March for Science - Cambria. Gail Bunting of Together We Will Cambria was one of the Cambria march's organizers. 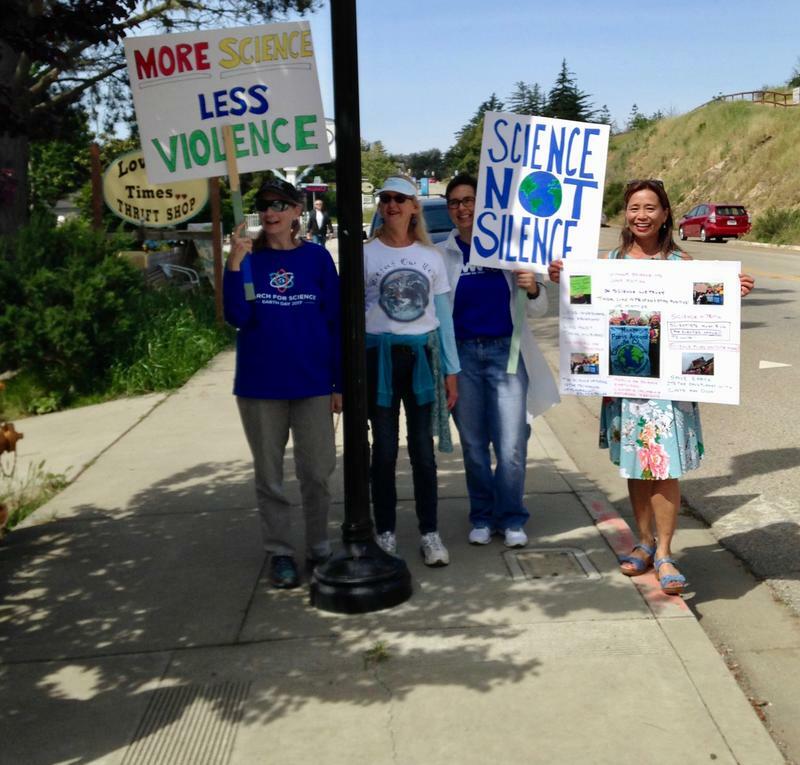 Cambria residents show off their signs at the March for Science - Cambria. March for Science - Santa Barbara organizers Jorie Mitchell (left) and Hannah Armer cheer as the march begins. Mitchell studies biology at Santa Barbara City College and Armer studies aquatic biology at UC Santa Barbara. Marchers' signs at the Santa Barbara march. "This is not a Republican or Democratic thing. It's between sanity and insanity," says Santa Barbara Mayor Helene Schneider. She spoke Saturday to a crowd gathered at De La Guerra Plaza for the March for Science - Santa Barbara. "Half of us would be dead today if it wasn't for science," says UC Santa Barbara Biological Oceanography Professor Debora Iglesias-Rodriguez. She spoke to a crowd at the March for Science in Santa Barbara. On Earth Day this year, the March for Science took place around the globe. There were 43 marches in cities and towns around California; here on the Central Coast marches were held in Monterey, Cambria, San Luis Obispo, and Santa Barbara. 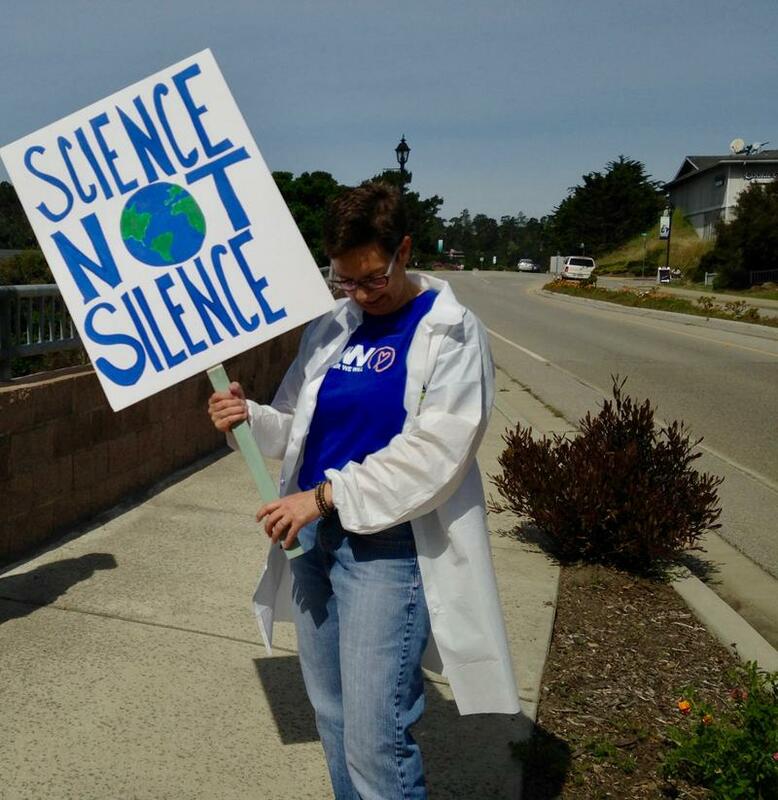 Many marchers carried handmade signs, some wore paper lab coats, and all walked in solidarity with the scientific method and evidence-based policy-making. Thousands turned out for the marches in Santa Barbara and Monterey. The event in Santa Barbara started with a rally and speeches in De La Guerra Plaza. One speaker was UC Santa Barbara Biological Oceanography professor Dr. Debora Iglesias-Rodriguez, who came to UCSB from Spain. Saturday’s march in Santa Barbara was particularly significant for locals because of the reaction to the 1969 Santa Barbara Oil Spill--which prompted the founding of the annual Earth Day in 1970. Several hundred people gathered in San Luis Obispo for speeches and a march. Dr. Heather Harris is a wildlife veterinarian who teaches at Cal Poly. “I was very excited to attend our science march. I work in science, and have a number of friends who are professional scientists here in the SLO community, so we all went together as a group,” Harris said. "There were quite a few students [participating in the march], and that was really fun to see the younger generation of people who are learning about science, and were getting really excited and fired up about seeing professional scientists out there fighting for our right to use data and evidence for policy." 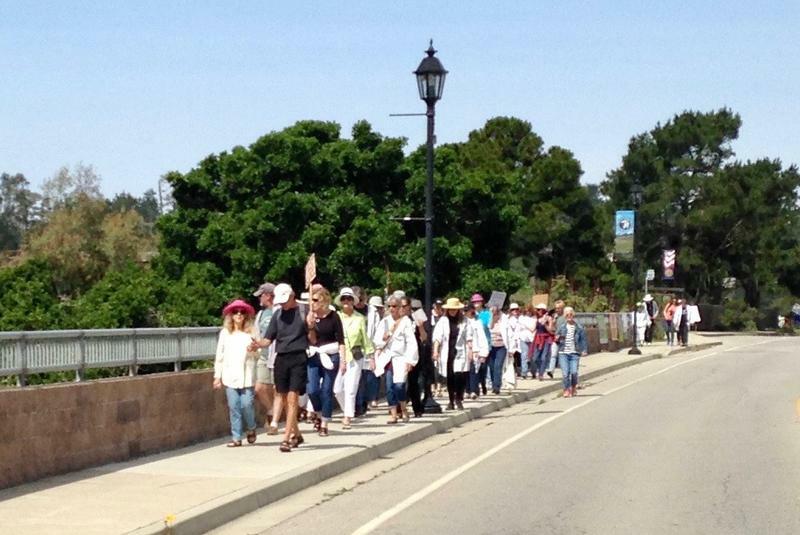 One of the smallest marches in California took place in Cambria - about 50 residents gathered in a downtown park for speeches and subsequent demonstration along the town's sidewalks. “We really need to get involved. This is not a political matter, it should not be. This is our life, our livelihood. Science brings prosperity. 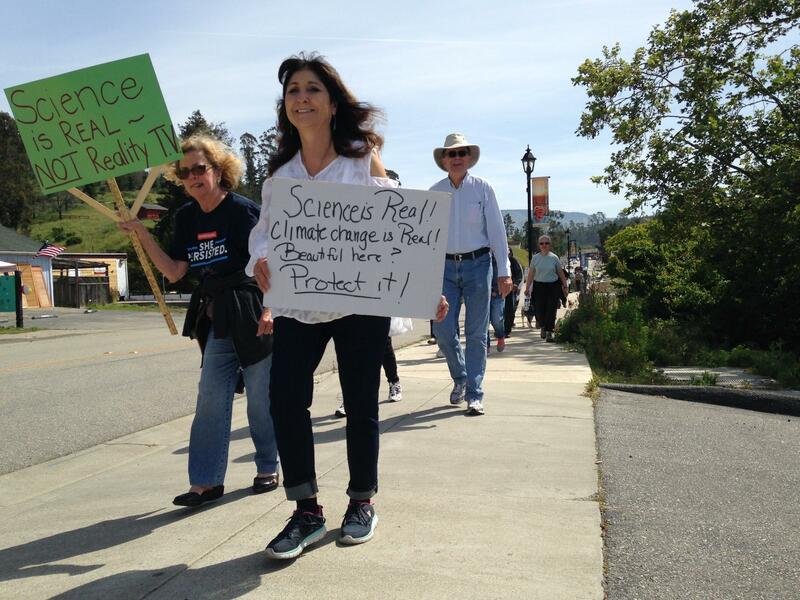 Science is truth,” Cambria resident Chantal Donahue said. The organizers of the international March for Science called for a week of action through April 29, urging people to promote science outreach and contact politicians to express support for science funding.